Public interest practice is a key professional value of lawyers. 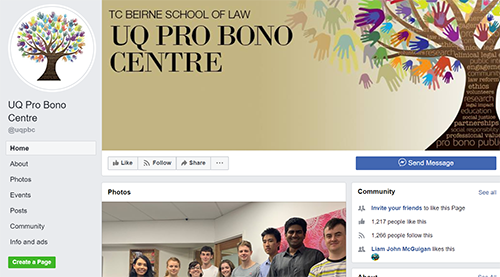 Through the Pro Bono Centre, the School of Law would like all its law students to recognise the value of pro bono work, and to commit to undertaking pro bono work both while they are students and in their professional careers. The Centre is the only resource of its type in an Australian law school. Pro bono activities undertaken by students do not attract academic credit. Pro bono, by definition, is work for no reward. The benefits to students lie in the work experience, the professional networks formed, and the knowledge they are working in the public interest for the benefit of the community. Current UQ law student? Join the Pro Bono Roster to be notified of pro bono opportunities throughout the year. Don't miss out! Get the latest events and news from our students on Facebook. As well as offering a wide range of unique opportunities, the Pro Bono Centre and partners offer team opportunities on an ongoing basis. Discover the kinds of work you can do with each team. These opportunities are for academic credit and must be applied to separately. Enrol in LAWS5180 Clinical Legal Education to gain experience working directly with clients, or on research for law reform, in the public interest. View a range of international public interest study opportunities, including opportunities in Malaysia (Sabah, Borneo) and Thailand. The Pro Bono Publico, Latin for For the Public Good, award recognises and celebrates one graduating student each year who has made an exceptional contribution to the community through their pro bono legal work. Nominations are now open for students graduating in 2019. The kind donations of our supporters enable the Centre to continue to help the most disadvantaged in our community to access justice and teach our students the value of pro bono work.